Premarital Counseling: How Will it Benefit You and Your Partner? You’ve heard of marriage counseling, but what about premarital counseling? 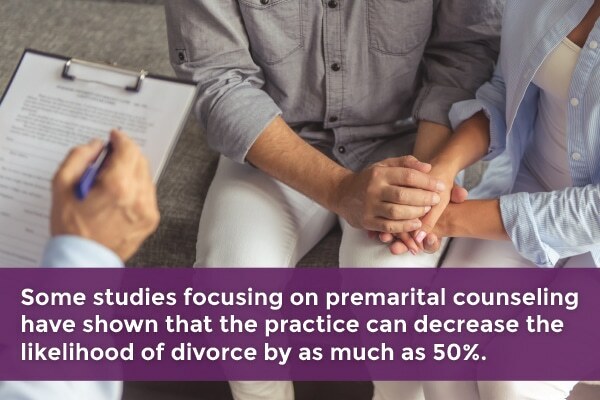 According to experts, such as BYU psychology professor Scott Braithwaite, some studies focusing on premarital counseling have shown that the practice can decrease the likelihood of divorce by as much as 50%. Here are some scenarios in which you may want to consider attending couples counseling with your partner before you officially ring the wedding bells. Cohabitation is one way that modern couples “test out the waters” before marriage. While living together, you get to know each other’s private personas and habits. Still, there are many reasons a couple may not live together before they decide to marry. To avoid any surprises about cohabitation expectations the two of you may have, premarital counseling can be a good choice. A counselor can help you explore solutions to issues of marriage and cohabitation that you may not have thought of. Creating a solution before a disagreement breaks out is always a great plan. It’s normal for couples to feel nervous before a wedding. Marriage is a big life event, and people want to be sure they’re making the right choice for themselves and their future, even when they truly love their partner. If you or your partner is having doubts about the effects of marriage on your lives and relationship, premarital counseling could be an avenue for working through that anxiety and doubt. Dependents? Debt? Working through previous trauma and victimization? If you have certain kinds of what some refer to as “baggage,” your relationship is already set to face some challenges. Confronting issues like these together can make relationships and marriages stronger in the end, but they also have the potential to cause significant problems. Premarital counseling can help you come up with a solid plan to tackle the obstacles you two already know lie ahead. You can plan to care for your elderly grandmother at home, to take on a step-parent role, or to pay off lingering student debt. Another common issue for couples is when one of the two is dealing with trauma and victimization they experienced in childhood or in a previous relationship. Some results of that trauma may not show up until you move into the next stage of your relationship: marriage. Being able to understand one another’s most sensitive emotions and needs can be done delicately and respectfully in a premarital counseling situation. A healthy relationship will inevitably have its share of disagreements. Not all of them are avoidable, and that is okay. Plan ahead with your partner for the potential roadblocks, and give your relationship and marriage the best chance at success. If you and your significant other are looking to take the next step in your relationship contact Keri Powell Therapy to explore the benefits of premarital counseling.